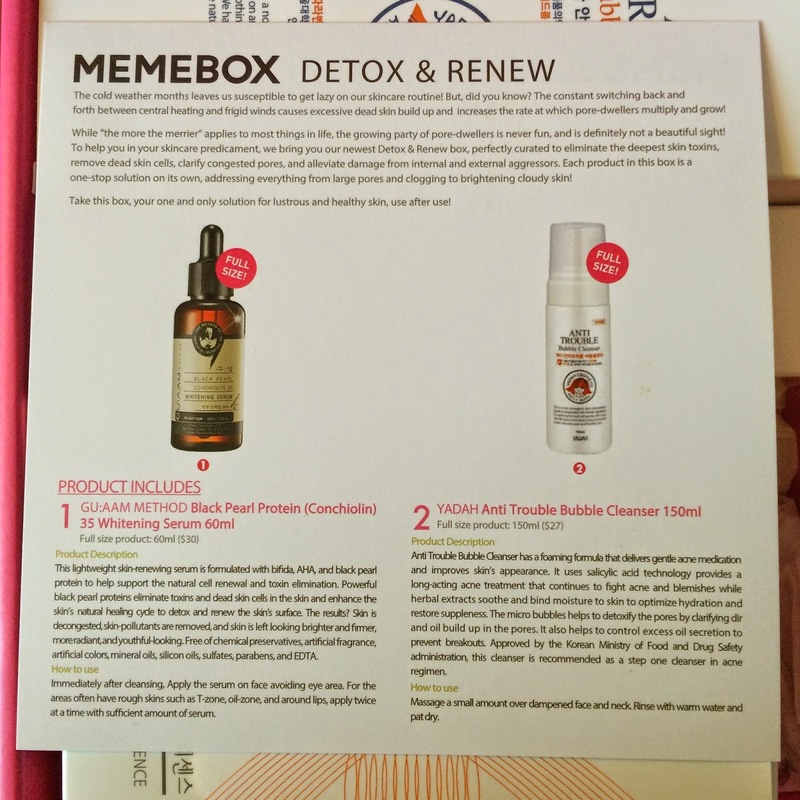 This is the "Detox and Renew" Memebox - designed with products said to remove dead skin, eliminate toxins, clarify pores, and repair damage. 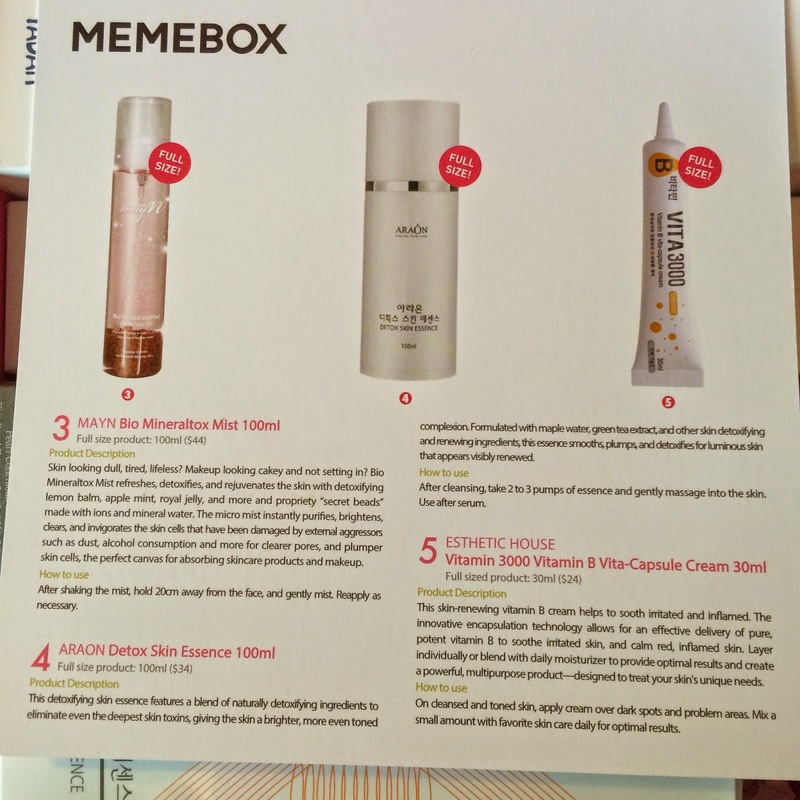 Let's take a look at the products Memebox chose to live up to these expectations. The name of this serum implies that it's a whitening serum, but that's only one of the features this product brings to the table... err... face. As well as lightening dark spots on the skins surface - it also uses AHA and black pearl protein to speed skin turnover and keep your skins surface renewed and fresh. So far I really enjoy this product and feel like it's helping to lighten sun spots and acne scarring. Cleansers are something I do not need more of, and while this looks like a great acne cleanser with the included salicylic acid - I will be passing this one along to a friend. Face mists were new to me when I first became interested in korean beauty, but once I tried them there was no turning back. They refresh your face during the day whether you're going au naturel or have a full face of makeup. This mist clarifies, brightens, and refreshes the skin immediately - and is something I actually keep accessible to wherever I am in my house every day. As simple as something like a mist sounds, it really helps keep your skin moist and fresh. Ok, first of all, this is a huge bottle for an essence! I was really surprised when I took it out of the box and saw how the bottle looked large enough to contain a cleanser. This will last quite a while - and I am very happy about that! This serum is comprised of natural detoxifying ingredients that purge impurities and toxins from the skin. This is another product that I couldn't find a full ingredients list for, so I have to hope that with all these amazing purifying ingredients, that there is nothing nasty in the serum either that will cause a break-out. So far, this is one of my favorite products in this box! This vitamin b cream is designed to sooth irritated and inflamed skin, which in my mind screams that it's perfect for troubled skin (or skin prone to acne breakouts). It is a very rich cream on it's own, so I use it at night mixed with another moisturizer to help it absorb better and give my regular night creams an extra boost. It definitely calms any redness within minutes of application - so this cream is a real highlight of this particular box for me. 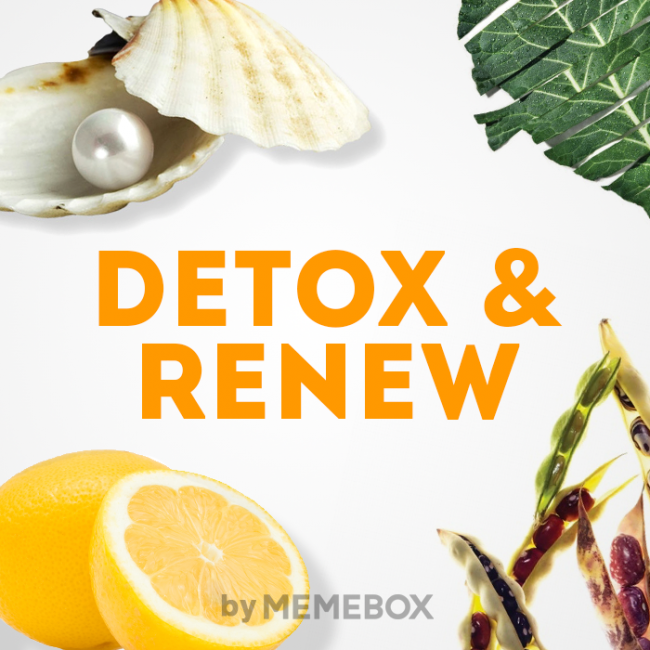 Do you have any thoughts on the "Detox & Renew" Memebox? Disclaimer: The Glitter Chic blog purchased/received the product(s) mentioned in this post for the purpose of review and evaluation. No monetary compensation was received for this post. The Glitter Chic blog will always provide honest opinions, beliefs or experiences on products reviewed. If you have any questions, please contact me at gothickornchic at gmail dot com. This blog contains affiliate links. The Glitter Chic is not responsible for prize delivery. The disclosure is done in accordance with the Federal Trade Commission 10 CFR, Part 255 Guides Concerning the use of Endorsements and Testimonials in Advertising.